The Best Selection of Diaper Cakes for Any Baby Shower! 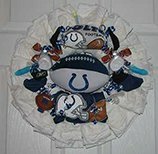 Unique Diaper Creations, Bouquets, Corsages, Diaper Wreaths, plus Shower Favors! you in All my creations! I were receiving it myself! Little someone into this world! Gift Packages & New Baby Gifts!! Great baby shower table centerpieces! 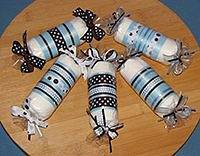 Towel Cakes, Diaper Candy & More! Special theme and don't see it? or baby gift for your shower! your budget, product and theme. Have your baby shower diaper cake designed with customized embroidered baby items. A wonderful way to specialize any baby shower gift basket. Have your diaper cake designed with your special theme and specific budget in mind. NFL / MLB / NHL / NASCAR / College Sports teams, Disney and Winnie the Pooh baby gift ideas. wear at your Baby Shower Party. Even the Daddy would like a Baby Boutonniere! Decorative Baby Carriages, Diaper Bears & Castles. For your guests to take home as baby shower favors! Thank You favors, add to the baby shower Wishing Well or your Newborn Baby Gift Basket. Plus any of my products can be customized to fit any budget or color scheme. Naturally organic diapers are also available along with many other awesome options.